Continuing adventures in yarn production have seen some dramatic improvements. Although my first attempts produced a hugely thick and uneven yarn that I struggled to imagine what I could do with, subsequent days ended with stuff that I am much more proud of. Albeit it is still a little bit on the 'slubby' side with a lot of thick and then thin bits. Spinning is a hobby that comes with a whole new vocabulary - this contraption for skeining the finished yarn is called a 'niddy noddy'. On the horizon is the prospect of acquiring a couple of fleeces from friends later in spring when their sheep get their annual haircut... these sheep are all white in colour and I hope to be able to not only spin enough wool to make a jumper but also to try dying it with some vegetable matter gathered off the finca. So many hobbies... so few hours in the day! In the meantime I struggled to think what to do with the yarn already spun... not enough of it for anything substantial. And then I happened upon a continuous thread loom on the internet. 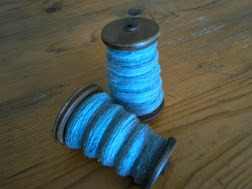 After watching a how-to video it seemed to me a perfect use for a slubby, thick and thin art yarn. Since we have a policy of not buying anything that we could make ourselves my first port of call was the very talented Steve. Some of the woven squares sewn together ...but with these little squares all sorts of projects come to mind. My very thick yarn was not really suitable for the little loom so instead I knitted a small cushion cover. I am fairly pleased with it... I hate waste so I am delighted that I have been able to make use of my first attempts. A BIG Thank you to Thriftwizard for her very encouraging comments which have all been taken on board. And now to the EGGS.... One of our little black Castilian hens laid this giant egg on the left of the picture. The normal weight of an average egg from one of my girls is around 60g... this one weighed a massive 100g! And she is only tiny... ouch! And yes you might have guessed what was inside.... A double yolker... which was delicious! Wow, your yarn-spinning is amazing and you are getting such good results - and turning it into Real Things! Thank you for your praise... I think I still have a long way to go to be really proficient at it but I am enjoying it enormously and finding a use for all the yarn is very important, and it is great to know that even the rubbish produced by a very very beginner can be put to some practical use. Great hobby ... would recommend it! Thanks for all the support, spinning in a vacuum here is not easy and so many kind comments have really helped. Sadly I have now run out of fleece... but April is coming and I shall have more than enough to keep me occupied then!